iGuzzini Illuminazione celebrates the centenary of Ettore Sottsass's birth, consolidating its relationship with the Triennale di Milano as well as its commitment to the conservation, promotion and enhancement of Italian design. As from Thursday, 14th September, iGuzzini is proud to take part in the exhibition project dedicated to the Austro-Italian architect and award-winning designer of the Olivetti Valentine, at the Architecture Gallery of the Palazzo dell’Arte, in Milan. The narrative layout of the exhibition, curated by Barbara Radice and set up by Michele De Lucchi and Christoph Radl is dedicated to the unfinished project conceived by Sottsass in the 1990s for the German publisher Wasmuth. The exhibition showcases the multifaceted and vast activity of the artist incorporating architecture, design, photography, painting, furniture, sculpture, glass making, ceramics, editorial and writing. Inside the exhibition space, showcasing Gae Aulenti’s architectural design and Piero Castiglioni’s lighting project from 1994, the light of a bespoke version of iGuzzini’s iconic Cestello maintains the aesthetic coherence with the pre-existing lighting solutions. iGuzzini’s Cestello is a true lighting archetype that allows flexible and customizable lighting effects. These are achieved by combining individually adjustable light sources that blend general and accent lighting. The product was designed by Gae Aulenti and Piero Castiglioni for the Palazzo Grassi in Venice in the '80s. iGuzzini redesigned it through product innovation, technological quality and aesthetic refinement in the '90s, when it entered industrial production. iGuzzini’s Cestello, now a Made in Italy icon, is currently exhibited at the Piaggio Museum of Pontedera as part of the exhibition “50+ ! The great game of the industry”. 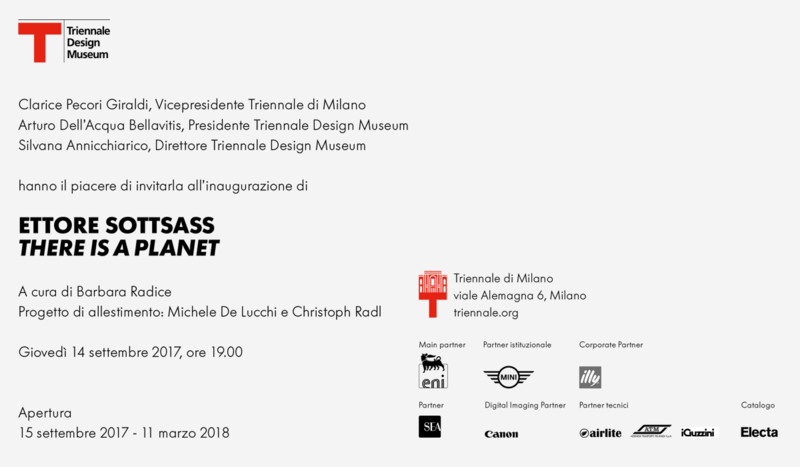 The exhibition “Lightinprogress - Where there’s a new light”, set up by Pierluigi Cerri, and the new LED lighting project of Piazza della Triennale in Viale Alemagna, inaugurated during Expo 2015, feature among the latest collaborations between iGuzzini and the Triennale of Milan. Further information on the “There Is a Planet” exhibition, opened until March 11th, is available here.